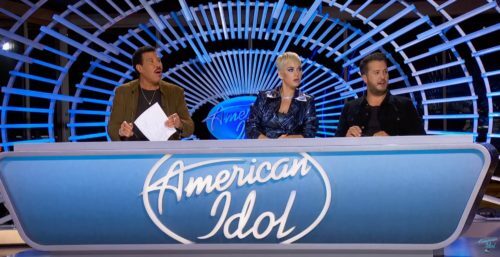 When American Idol judges Katy Perry, Luke Bryan, and Lionel Ritchie first saw contestant Jorgie and his band walk into the audition room, they looked a little dubious. And when they found out the group performed as “Jorgie and the Jorgies,” they were even more skeptical. But when Jorgie gushed over Katy Perry, he also credited her with his decision to come out as gay. But Jorgie admitted he hadn’t come out to his family yet. Saying he has such a distant relationship with his father, he didn’t even know his son was a singer. While his touching story obviously moved the judges, when Jorgie started to sing his original song, “Heaven,” they were blown away. Instead of a kitschy bubblegum pop style, the flamboyantly dressed singer launched into a song just as emotional and raw. He wrote it about a guy he had a crush on but never came out to. And it blew the judges away. In fact, he was so good, all three judges took to Twitter as the show aired to encourage him further. And so did viewers…. Favorite audition tonight so far!